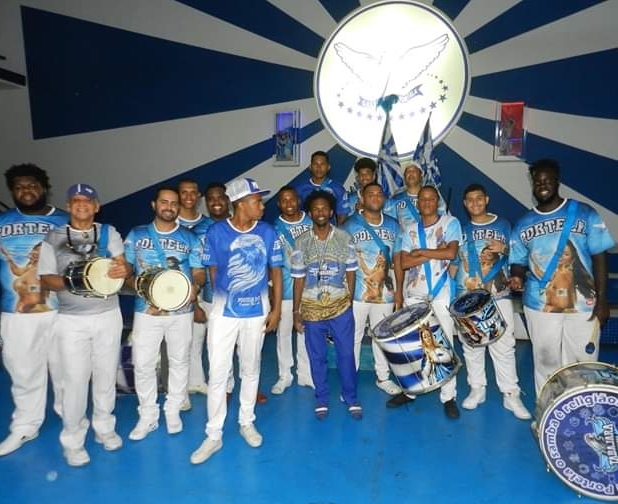 Episode 46 Douglas Jorge, Portela Samba School Bateria Director. Douglas Jorge is a descendent of samba royalty! He is the Grandson of Alcides Gregorio, who was one of the founders of Império Serrano Samba School. Alcides Gregorio was also the Império Serrano’s first Bateria Mestre. Douglas is also grand nephew of Mestre Fuleiro, another founder of the Império Serrano. Douglas’ father is Mestre Faísca, who was also Bateria Mestre of the Império Serrano. Douglas is the nephew of the current mestre of Portela, Mestre Nilo Sérgio. He was baptized into the world of samba at the age of 8 by Mestre Marçal (who is also his godfather) in Império Serrano, in a recording for the Video Show program in the quadra of Imério Serrano on Globo TV. Douglas himself is following in the footsteps of this tremendous family. Douglas Jorge is currently a director of the bateria at the samba school, Portela. And Douglas is not only involved with samba, he also teaches and plays candomblé, umbanda, and angola traditions. In addition, he assists with various bloco projects around, as well as others. Douglas is also a professional percussionist. Samba drums and gear available here.